I haven't made a new dress ;-) I've actually made the blue dress this winter. But currently I've been wearing it during MeMadeMay2016. The pattern is Vogue1250 by Donna Karan. It's really quite lovely with pleats at the shoulders to accentuate the neckline. The pattern emphasizes the shoulders. So if you have rather straight shoulders like me adapting the shoulder seams to less width or even short sleeves (which I did not do) would be an option. Next time I make up the pattern I'll go for narrower shoulder pieces. I made a size 10 and it fits perfectly. The dress goes together quickly and easily and is a total pleasure to wear (except for the circumstances I mentioned above :-)). Also you don't need much fabric (only 1.2 metres for sizes 6 to 14). This means the dress is a win for the wardobe of every woman on a good day ;-). I can't believe I haven't written a post in over two months! So it really fits well to post about this dress today since it's been almost one year since I've made it. I originally started it around Christmas as a sort of muslin for the dress I actually wanted to sew. I thought the fabric to be too curtainy and shimmering for my liking. Then I changed my mind! Which seems to happen quite frequently and even more often when my sewing is concerned. So, I started liking the fabric and decided to finish the dress as prettily as possible - it wasn't really possible to do that completely because I had to change the fit more than a little bit. And in one or two places I had to compromise, but I'm still happy with the outcome. The next picture is a bit blurred because I'm trying to twirl - although there's no big reason for that in this dress. Hallo zusammen, da ich heute beim Me Made Mittwoch teilnehmen will, ist dieser Post zweisprachig obwohl ich sonst nur auf englisch poste. Alle die gern englisch lesen haben es etwas ausführlicher, aber die Anderen bekommen zumindest auch ein bisschen Text ;-). Another thing I can't believe is that I haven't managed to wear it at least once it in all this time!!! First the corresponding slip was missing. And it's sheer enough that I wouldn't ever wear it without one. Then when the slip was made there was no occasion. No birthdays, dinners or anything since the middle of August. And then no time to make up an occasion. Uh oh ...and then it got cold again - naturally. And here is it - tadaa - the first outing! Ich kann kaum glauben, dass ich seit zwei Monaten rein gar nichts geschrieben habe - genäht habe ich aber schon, deswegen bin ich jetzt schwer im Verzug. Da passt dieses Kleid sehr gut, da es auch höchste Zeit ist, dass ich es endlich mal anziehe, es ist nämlich schon ein Jahr alt und noch völlig ungetragen. Und hier nun der erste Auftritt. The fabric was a scrap from the sales table at our local fabric store. And I'm not sure if it was designed for clothing because it has a rather stiff quality and is also a bit scratchy at the edges. It would probably also make an eccelent curtain ;-). Because of the scratchiness I had to hide away all raw edges on the inside. So most are french seams or bound with a hong kong finish. Leider sind manche Bilder von eher schlechter Qualität wegen des schlechten Lichts drinnen. Aber ich hab schon drinnen in dem dünnen Kleidchen einen Niesanfall bekommen, draußen wäre ich wohl erfroren. Mein Stoff ist ein organzaartiges Gewebe von Restetisch, das auch als Gardine bestimmt gewesen sein könnte. 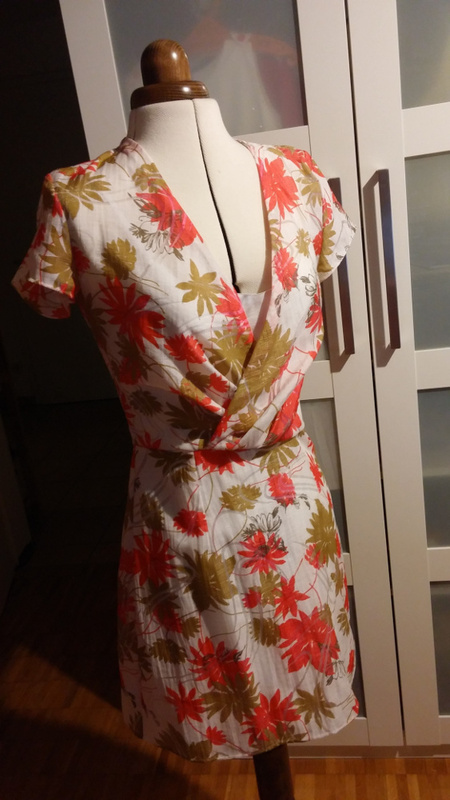 Eigentlich sollte es auch nur ein Muster werden, aber dann hat mir der Stoff doch trotz anfänglich arger Zweifel gut gefallen und es wurde ein fertiges Kleid draus. Der Stoff ist an den Rändern ziemlich kratzig, so dass ich alle Katen komplett mit Stoff einfassen musste. Und damit ihr seht, wie hübsch das trotz einiger Kompromisse dann noch geworden ist, hier ein Bildchen. Mein Schnittmuster war Mod.127 aus der Burda vom Dezember 2012. Das ist eigentlich für Jerseystoffe, ich hab es aber (eher aus Versehen) für meinen Organzawebstoff verwendet. Die Nahtzugaben hatte ich Gott sei Dank breiter zugeschnitten, Puh! Es ist trotzdem etwas eng an den Schultern, aber passt sonst ganz gut. The slip is the slipdress from Vogue 1217. And it fits nicely. I had to take in the upper side seams a bit but I'm still not very used to Vogue sizes. Wie man sehen kann ist das Kleid sehr kurz. Mein Mann meint beinahe zu kurz ;-) Und da glaubt man immer Männer hätten es gerne kurz, aber sie können ja so konservativ sein. Das Unterkleid ist das vom Vogueschnitt 1217 oben. Es passt jezt sehr schön, musste aber an den oberen Seitennähten etwas enger gemacht werden. Here's the dress on my lady, too, and I have to admit it might suit her better than me. Maybe I should give it to her as a present. Otherwise she'll be naked again half the time. 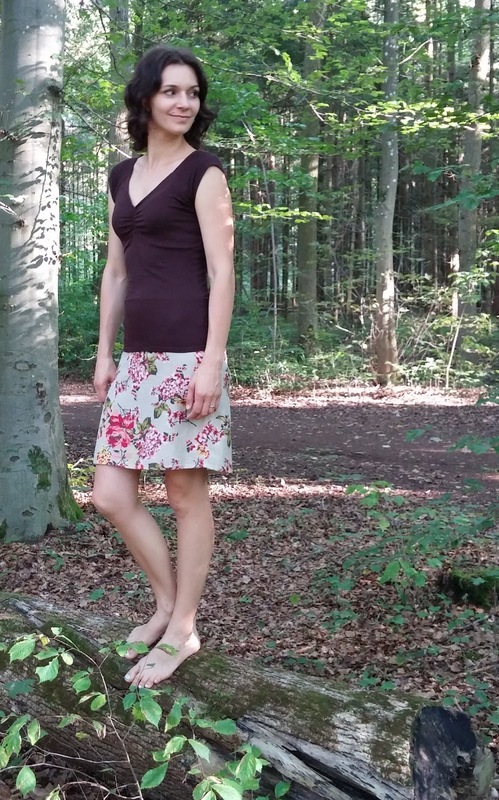 Und hier noch das neue Kleid an meiner Kleiderdame, der es fast besser steht als mir ;-). Ich sollte es ihr vielleicht schenken, damit sie nicht so oft nackig herumstehen muss. Und für alle die vom Me Made Mittwoch gekommen sind, genießt die super Nähergebnisse der Anderen! Viel Spaß und noch einen schönen Mittwochabend! 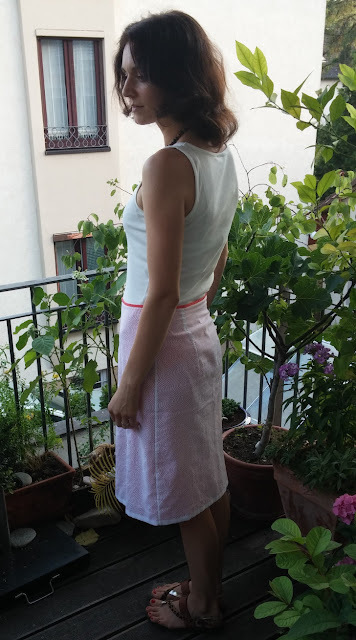 Some days ago I found an initiative by Susanne a German blogger (Mamimade) and sewist who called upon other (private) seamstresses to participate in composing a catalogue of self-made clothing to protest against the exploitation of seamstresses wordwide. To call out that THIS IS NOT OK! This is no demand never to wear RTW clothing again or agything similar. The initiative simply wants to make an appeal to start thinking (differently) and to try other ways than exploitation. That's how I read it. I wanted to participate very much. When you do a lot of sewing yourself you start to realize the real worth of the job and how much one would have to pay to really do the effort some justice. Beim Lesen und Bloggen habe ich neulich bei RUMS - wo ich zum ersten Mal mitgemacht habe eine Aktion entdeckt. Und wollte unbedingt mitmachen! Nähbloggerinnen protestieren gegen die Ausbeutung der Näherinnen durch die Bekleidungsindustrie. Mit einem eigenen Kleidungskatalog. Mit ausschließlich selbst genähten oder gebastelten Kleidungsstücken. Einfach nur so wie es oben steht, als Aufruf zum Umdenken! Um zu sagen wir finden das nicht gut was da passiert! Die Aktion ist eine Idee von Susanne von Mamimade und wie ich finde eine richtig gute Idee! So und damit jetzt alles hier seine Richtigkeit hat auch noch die Angaben zu meinen selbstgemachten Sachen. 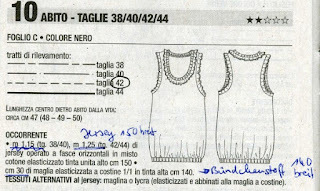 And to "prove" that the garments shown were really made by my very own hands here some details. The skirt is Mod. 121 from Burda issue 7/2013 and quite an oldie. My shirt is made from my own pattern which is based on a ancient RTW shirt of mine that is almost threadbare now. It (the pattern) is still in the process of being tweaked and refined. Which is still necessary, just have a look at the low under breast seam! Außerdem trage ich noch Ohrringe, die stammen aber auch von mir. Die Perlen sind ursprünglich von einer Kette die meine Schwiegermama wohl vor über 30 Jahren aus Marokko mitgebracht hat und die ursprünglich auf Stroh!! gefädelt war. Danke für die schönen Glasperlen, sie sind wirklich ganz besonders! I'm also wearing some blue earrings made with Morrocan glass beads. 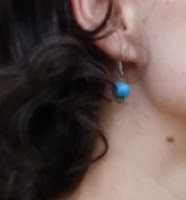 I made these myself when I rethreaded a necklace made of glass beads that my mother in law had given me some years ago and that she had brought from Morroco before she had her children. Thank you for the beautiful beads, they're very special! 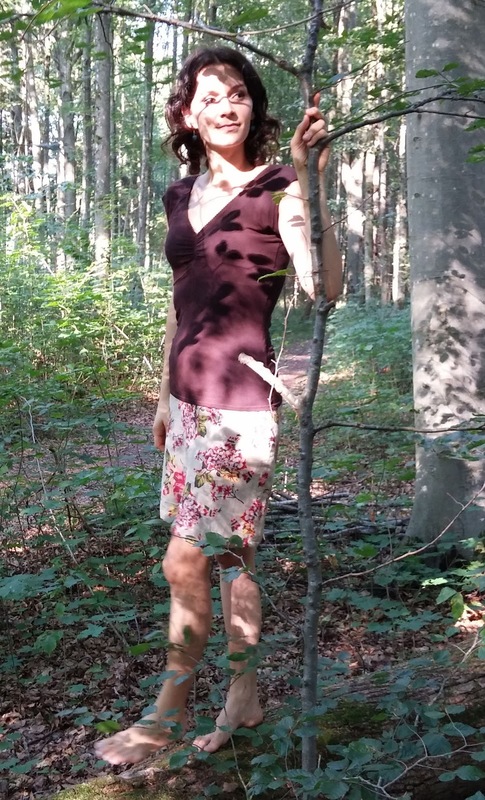 Heute war nochmal so ein wunderschöner Sommertag, den wir genutzt haben um einen großen Waldspaziergang zu machen und in einem der Stadtbäche zu planschen. Das Licht war irgenwie ganz besonders - ich habe versucht das oben im ersten Bild festzuhalten! Today's weather also was very special! Hot and dry with the clean air of the days after the rain - one of the last days of summer. We went for a long hike through the forest and splashed about in one of the creeks. The light was also a bit different today - I tried to capture that in some of my pictures, too! Ich hoffe ihr schaut bald wieder vorbei! Hallo! Heute zum ersten Mal mit bei RUMS und zwar mit englischsprachigem Post. Alle die das nicht so mögen dürfen gerne Bildchen gucken! So today's theme is "Ciao Italia" - with summer being almost over and my breezy Mediteranean mood sure to vanish soon I thought I'd try to style myself as an Italian diva. My dress is from "La mia Boutique" again. The second dress from it now which is olive coloured and reminiding me of ... guess what? Italy! I made the dress from an olive green crepe georgette which was formely dedicated to the making up of Vogue V1387 by Rebecca Taylor. But somehow Vogue V1387 didn't make the race. 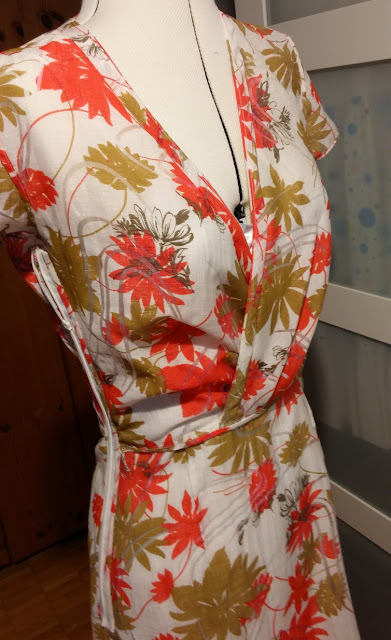 When I was just about to cut out the pattern pieces I was suddenly unsure if the wide shoulder yokes would suit me so it went back into my pattern stack. 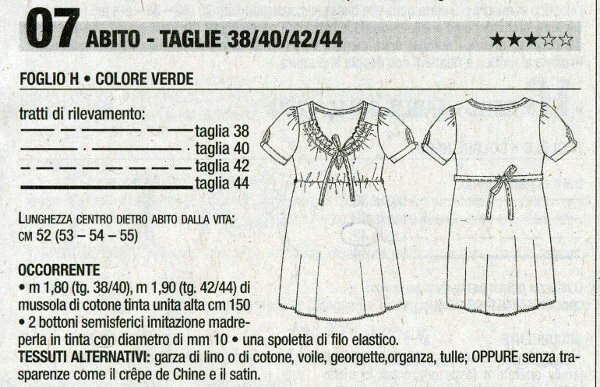 And I chose one of the patterns from "La mia Boutique" instead. 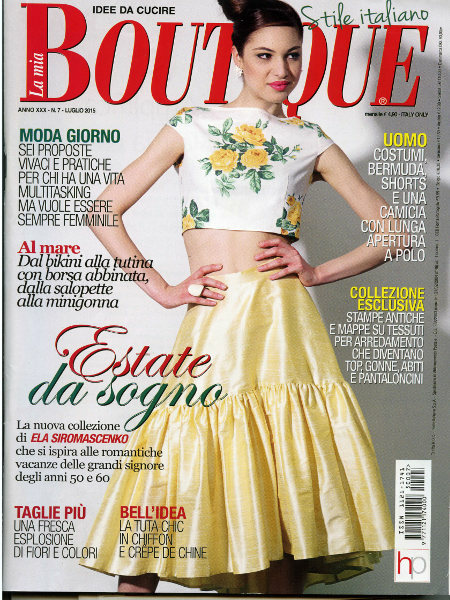 It's dress 7 from the July 2015 issue. Do you love wearing it? Yes, of course, can't you see that. How does it feel? It's light like a feather and caresses the skin. Do I think it has Italian flair? Naturally, since it was designed in Italy. Would I make it again? ....Hmm, let me think about that. 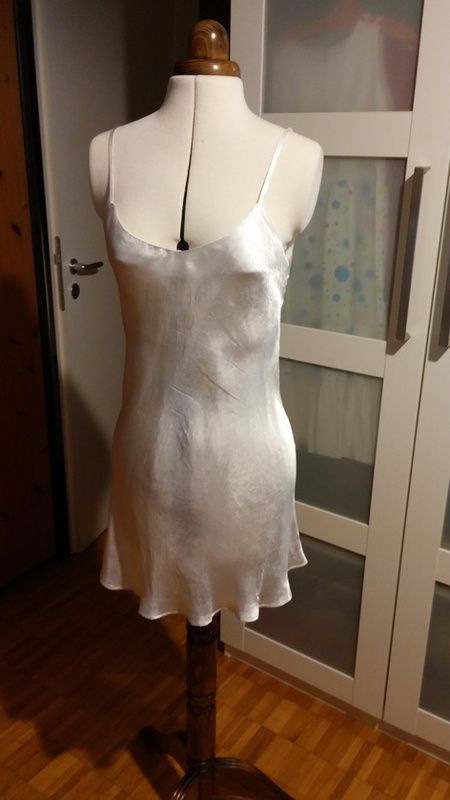 I also made a white slip dress to go under the olive dress. I made it from white viscose satin. This means that it's visible under the sheer fabric. That's not really bad but I think I will make a second one in a green rayon fabric that's somewhere in my stack. The reason I made a white one at first is that I also intend to wear it with another sheer dress (white floral) which I hope to blog about soon. I'd like to show you a few more pictures. You can see that the fabric is varyingly transparent depending on the light. As you can see my dress is gathered with an elastic in the front and tied with straps in the back - and also around the bodice (which you can see in the above pictures). Und für alle die ganz brav bis zum Ende dieses englischen Posts durchgehalten haben hier der backlink zu RUMS. Danke für's Englischlesen! Lately I've been busy sewing summer wear. A bikini among some other things I desperately needed before the end of summer. Actually I had the honor to test sew the brand new Splash bikini pattern by Lily Sage which has been just released. The design which is grand and at the ultimate hight of fashion is by Debbie Iles the creative mind behind Lily Sage. Thank you so much Debbie. Her style of patterns is quite cool, mostly straight lines - maybe even a bit anvant-garde. Next I'll probably try the swimsuit version of this pattern which is absolutely great as well! The design is very special and grants everywoman enough coverage I think - small or big assets. For a little more support breast wise you can always fold back the lining before attaching the side bindings and leave an opening through which you can insert bra cups - e pronto padded cups the quick version! The pattern comes in sizes 6 to 18 which is quite a range. Also the sizes are easily mixable. I made a size 12 which I believe should fit my measurements best, but maybe a size 10 would have been enough, too. I chose a fabric with relatively little spandex in it. If I had taken one with more spandex the fit might have been a bit tighter. But it was still very good. If you are above average height you should lengthen the pattern pieces of the pants - something you would have done anyway I guess - to have your pants waist high in the end. In the end I cropped my pants to half height (see picture above) because I was a bit too tall for the unlengthened version. My fault - I should have added some length from the beginning but I wanted to make up the pattern unaltered first. All in all there were no unexpected difficulties or surprises, everything went together smoothly and I love wearing my new bikini.Below you can see the waisthigh version - cool hmm...?! As I've already mentioned I'm very keen on trying the swimsuit next. I've seen some gorgeous other tester versions that you can find on the blog of Lily Sage. There's this dress version I like very much. You just slip it on - no zippers or buttons - and it's easy to wear, very comfortable and casual. Recently I've made one of the millions of possible dresses that fit this description. Mine is made of a jersey in a light blue melange and has ruffles around the armskyes and neckline. Otherwise it is or rather should be a simple tube dress. If it weren't for those giant back darts I added. I made a size 42 because I thought it would fit me best - not too baggy, not too snug. But I think a 40 would have been better, since I added pretty big darts in the back to achieve a better fit - and it's still not too snug. The darts folded nicely to the outside and were lying flat so I did't cut the dart fabric away. Also I was a bit worried I would create bulky seams which wouldn't lie flat on the back of my dress. Would have destroyed the slight clinging to the waist, no? So a little vainity was involved, too! ;-) Pleading guilty. You can see that I left the inner edges of the jersey raw. I found the ruffles and jersey binding bulky enough without another added layer of jersey turned under. 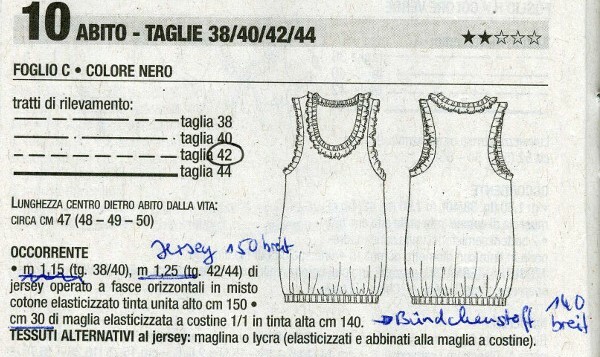 The technical drawing shows that the hem should be bound by a broad band of jersey maybe even some elastic!? And it should be gathered. My Italian is nothing to speak of. So obviously I couldn't read the instructions. After some consideration I slightly held in the seam, serged on a folded jersey band and zigzagged over the serging seam from the outside. I think it's pretty, rather even and the seam doesn't turn up. I'll definitely do this finish again. Can't say anything about the instructions as I didn't understand them. :-( /Definitely need to learn some Italian! The pattern is simple but very sweet, BUT could be worked out better. Darts or different spape of waist part would be nice. And because I love it so much a few more pictures I have to show. Airy summer skirts really are an undisputed must-have when summer has arrived. 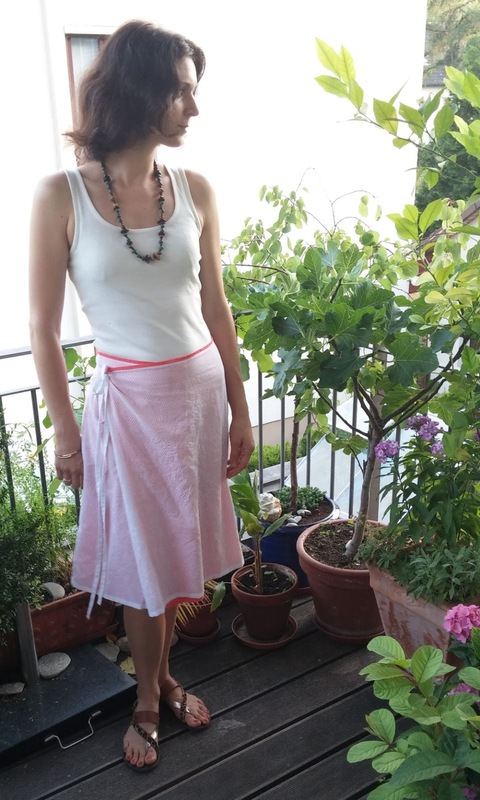 And it really has by now ;-) So summer flats on, airy skirt and breezy top and off you go to the lake or wherever you prefer to spend your time off. You see it was just in time I got my skirt ready. Actually I got it ready a little while ago before we went on holiday to Italy. It is from a Burda magazine. 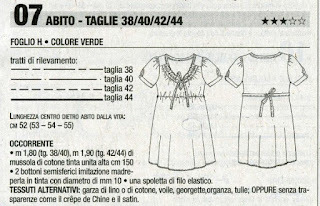 Burda 7/2013 Mod. 111. It's just a simple wrap skirt. It's sewed in double layers with the under layer a little longer than the upper one and the upper edge of the lining layer turned down at the waist. The front piece of the skirt is cut about 30 cm wider to create a fold which is then tied to the side. So it's a mock wrap skirt really. In the above pictures the skirt has shifted to the side which you can see in the left picture. Usually the side seam should be sitting on the side - who would have thought ? ;-). I didn't notice at all when taking the pictures because I had a race to win with my camera which kept switching off at random. Finally I got so annoyed with it that I couldn't take any usable pictures at all. My grimasses got worse with each try... You wouldn't really want to see, would you? That's why I used two different locations and most acceptable pictures were taken by my smartphone invested male counterpart. The camera's definitely out of my good graces! It's been throwing fits more and more often recently. The sewing instructions didn't include any fixation of the fold (and I didn't trust the skirt to stay where it's supposed to be). So I added a button on the inside of the skirt and two button holes one for each layer of the fold. Hopefully this way the fold can't escape and slip down too much. Also the viscose was a hell to cut the exact lenght at the hem. I did my best but it's still a bit wavy and tends to appear and disappear behind the top layer in some places. I'm not sure if it's just shifting to the side or really cut too short or long.... I've decided it doesn't matter too much. It's just a very casual summer skirt after all.